Today I am excited to be sharing a project with you that is NOT a card!... Yup, that's right. I don't have a card for today. 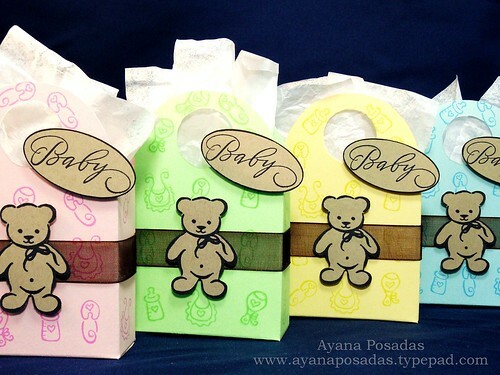 Instead of a card, I am sharing a small assortment of party favors that I made using the small gift bag template from DeNami Design. I was truly amazed at how simple they were to assemble! You can fill these bags up with anything you'd like. 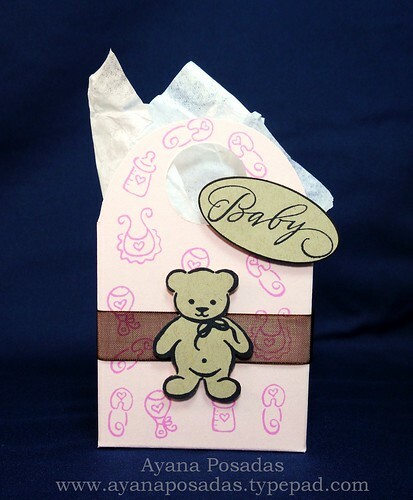 And even though I used them for a baby-shower theme, they could also be used for various other occasions as well. Just use your imagination and check out the rest of the fabulous DeNami templates HERE. Well, hope you guys enjoyed this project. I really hope many of you decide to join in with this challenge and make up some creative favors or gifts of your own. For more information, please check out the DeNami Blog. I hope everyone is having a fabulous weekend so far! My weekend has been very relaxing. I actually had the day off from work yesterday, which I enjoyed very much. I slept for most of the day. But when I finally woke up, I caught up with a few things around the house that I have been meaning to take care of lately. So that was nice. Then, at night, I went out for dinner and a movie with two of my close girlfriends. It's always fun to set aside some "girl-time" in your life!